More than 700 degrees were awarded at commencement ceremonies in December. Speaker Roger Truitt, ChE’71, discussed some of the changes he’s witnessed since he graduated 41 years earlier. 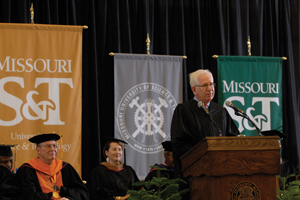 He also gave the graduates five pieces of advice — to do their job well and market what they do, to always do the right thing, to question the validity of the questions they’re asked, to give back to Missouri S&T and to have fun in life. Truitt is the retired senior vice president of ARCO and retired president of ARCO Products Co. He lives in Paducah, Ky. 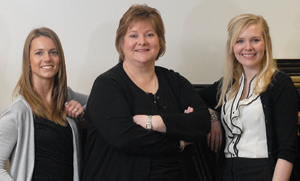 There are some new faces in the Miner Alumni Association office. Here’s your chance to get to know them. Administrative assistant Gillian Masters is the woman behind the cheerful voice that answers the main phone line. Masters came to campus last fall from Woodland Park, Colo., where she was office manager for a home health care company. Darlene Ramsay, MetE’84, is no stranger to most of you. The former Miner Alumni Association president is now the executive director of alumni relations and advancement services. She oversees the operations of the Miner Alumni Association and the university advancement research, annual giving, and record-keeping services. from Concordia College and a master of education degree from the University ofSouthern Mississippi. She is working toward a doctorate of education in educational leadership and policy analysis from the University of Missouri-Columbia. Make plans now to come to Rolla for Homecoming 2013, to be held Oct. 18–19. Watch for more details in the Summer issue of Missouri S&T Magazine. The Miner Alumni Association hosted its annual breakfast before the St. Pat’s Parade on Saturday, March 16, with coffee, juice, and cinnamon rolls, along with Mimosas and Bloody Marys. After the parade, alumni and friends celebrated with dollar beer and free hot dogs. Watch for pictures in the Summer issue of Missouri S&T Magazine. Or go online to bestever.mst.edu to see how S&T has celebrated for 105 years. Whether it was called the Cavern, Brewster’s, the Mine Shaft or Hiram and Mortimer’s, the Grotto has been a favorite hangout for generations of Miners. Last semester it was the home of the Grad Finale celebration. On Dec. 6, the Miner Alumni Association hosted 54 graduating seniors at the Grotto for darts, air hockey, pool and pizza — and learning about the benefits that come with new membership in the alumni association. Missouri S&T grads command higher starting salaries on average than Harvard grads. In September, ABC News asked PayScale for a list of colleges and universities whose graduates earn higher salaries than Harvard graduates right out of college. There were 12 of them. That data, based on 2010 earnings, showed that Missouri S&T grads earn an average starting salary of $58,600, while Harvard grads earn an average of $54,100 in their first jobs. That’s a pretty good return on investment considering annual tuition is $40,866 at Harvard and only $9,350 ($32,666 for out-of-state students) at S&T. 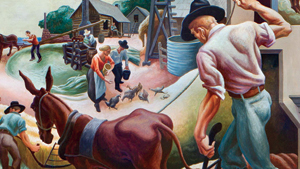 Muralist Thomas Hart Benton told the story of Missouri’s history in tempera paint on the walls of the House Lounge in the Missouri state capitol building. Missouri S&T’s Jim Bogan brought the mural, and its creator, to life in his video Tom Benton’s Missouri. This past fall, the film was re-mastered in high definition and re-released to mark its 20th anniversary. The film is available in a downloadable HD format with an educator’s guide that includes lesson plans for fourth grade through college, background information on the mural, and music from the film. “We hope that seeing the film in high definition will be like looking through the eyes of a sensitive and knowledgeable spectator,” says Bogan, Curators’ Teaching Professor emeritus of art history and film. Part of the restoration process involved refining the colors to make them truer to the original tempera of the mural. The film’s soundtrack was also enhanced. It features narration by Benton himself and historian Bob Priddy, as well as historical ballads written and sung by Bob Dyer. Luce Myers, a Missouri S&T art lecturer, worked with Kathleen Unrath, associate professor of art education at the University of Missouri-Columbia, and Abby Trescott, a Rock Bridge High School teacher from Columbia, Mo., to produce the Educator’s Guide. Collaborators on the film restoration include Michael Hicks, film and video producer with the UM Extension Cooperative Media Group; Frank Fillo, co-director of the original film; Gerald “Jack” Brown, a senior in civil engineering at Missouri S&T; and Jessica Hicks, an art education student at MU. Both the film and guide are available online at extension.missouri.edu/tombenton. Roger Weaver manages the digital collections at Curtis Laws Wilson Library, which now houses a digital version of every Rollamo yearbook from 1907 to today. A slice of Missouri S&T history is now available online, thanks to the efforts of S&T’s Curtis Laws Wilson Library staff. The library staff created a digital version of every issue of Missouri S&T’s yearbook, the Rollamo. The Rollamo yearbooks from 1907 to today are now archived together online at yearbooks.mst.edu. The year-long project required scanning and uploading roughly 7,000 pages from the 105 books. The digital archives allows users to search through all editions, bookmark, share and download individual pages, says Roger Weaver, the institutional repository and digital collections librarian at S&T. Ben Bayse, professor emeritus of mechanical engineering, published an autobiography titled Lightening Ben: I Flew with Eagles. Trent Watts, an associate professor of English and technical communication, wrote an essay titled “What Makes a ‘Newcomb Girl’? : Student Culture in the Progressive Era,” that was published in a book titled Newcomb College, 1886-2006: Higher Education for Women in New Orleans. S.N. Balakrishnan, Curators’ Professor of aerospace engineering, co-edited a textbook titled Advances in Missile Guidance, Control and Estimation.